Ever wondered where venture capital money comes from? Ellie Cachette is the money behind the money. She is the founder of Cachette Capital Management, her own fund of funds with $1B set for investing into venture capital funds. She’s the gal VCs stand in line to talk to! I sat down with Ellie to learn about her story and was blown away by how rough of a start she had and how inspiring her journey is. H: Tell me about the early days, where did you grow up and what did your childhood look like? E: I was raised in the Bay Area and we ended up there because my father had a blood disorder called Hemophilia, the Bay Area was at the time cutting edge for medical. So we moved to get access to doctors and hospitals for his health, for the best chance of life. Later though his Hemophiliac medicine became infected with HIV, it was horrible. The company (in his case) was Bayer Pharmaceutical and they knew there was HIV in their products yet still delivered it to patients because it was cheaper to offload the product than recall an expensive and lengthy product to make. My father and many other Hemophiliac patients (about 20,000 in the US, 100,000 globally) were infected with HIV. There were several class action lawsuits of which many people died before winning, my father got his payout a couple years before he passed away. The Bay Area became also an epicenter for HIV and AIDS treatments so we stayed. Soon after the news came (of my father’s HIV) in the late 1980’s my mom left us and my dad (newly HIV positive) was forced to raise me by himself. By the time I was nine years old the tables started to turn, and I was taking care of him because he was sick either from the HIV or his HIV medications or both. About my father: he was a self-educated entrepreneur, he had his own consumer biotech startup that he had launched in the Bay Area during the mid 1990’s, it was actually quite innovative for its time delivering medicines to people’s homes. I learned important lessons from my dad as he taught me how to have no fear, to live life and that I was just as equal as any man. He would often say even early on that I was bound to do great things, that I was a “fighter” and people would “read about her in the headlines someday.” It was probably wishful thinking or perhaps an observation. When my father passed in 2002 I was a Junior in high-school and became a legal orphan because I did not have a guardian other than him, so I could not access my own savings accounts and was kicked out of my house by his then girlfriend. There’s also another story here of fraud and deception where my trust money was stolen (the lawyer who assisted me with that case won a prestigious legal award this year called the Clint Hockenberry Award for his efforts in activism). It was really a hopeless time where I was fully on my own, but I basically crammed in community college classes my senior year of high school and got my bachelors degree from Humboldt State University as quickly as possible because I could not afford much longer than that. Neither of my parents ever graduated high school so it was important to me that I got a college degree despite the lack of support or setbacks. H: What did your early career look like? Where did you gain experience? I started working in tech in college (because I needed the money) so when I graduated it made sense to continue on that path. I remember while having a job as a product manager for a Romanian company my boss called me an entrepreneur and it struck me as odd, but planted the seed in my mind and unlike others in 2007 I was not afraid to work in Europe and this would pay off later on. At some point I was hired by macys.com and that was my first job fully in “consumer products” because before that I was doing mostly financial or insurance software products, very technical things. At Macy’s they wanted me to start looking for startups they could buy, apps which could be integrated and as I was doing that I realized that I had to build something of my own. I thought OK well my options are: I can stay here at a corporate job and sit in meetings, or I could go build something. In 2009/2010 I started exploring what I could build if I did build something on my own. The idea I ended up focusing on was ConsumerBell, a software product to assist with product recalls as it related to my dad’s story but I saw the market for the need growing with online commerce and goods shipping to people’s homes (Amazon). This product was definitely ahead of its time and I couldn’t raise money locally as everyone in Silicon Valley said that my idea was “cute” or more of a nonprofit. I then applied for TechStars Boston and ConsumerBell got in. Before heading to Boston I took a trip to New York to check things out and basically stayed, never doing TechStars or even making it to Boston. Everybody in New York thought my startup was a good idea and I was offered free desk space on Park Ave with some angel investors willing to support me. It appeared as a female founder I had a lot more support in New York vs. Silicon Valley, however this probably had to do with the start of the tech wave in NYC so the market timing was right. So I moved to New York. I will always remember packing up my apartment in California (my boyfriend at the time dumped me for all this startup madness) and I knew probably two friends in all of Manhattan, so I was shaking uncontrollably as I put my stuff in boxes. Was I nuts or what? That startup, ConsumerBell, kept building different products and different things and we eventually sold the assets and I wound it down. We had some pretty interesting paths we could have taken but shutting down had a lot more to do with several weird circumstances including an advisor and main customer committing suicide; then unrelated another employee’s wife committed suicide about five weeks later. At that point it was just too much losing a main customer, advisor and social structure around to continue. I shifted from ConsumerBell to a soft landing as a VP at a mobile development company that I had been working with for years, it was easy on the mind because my background was in product so I helped publish things for founders around MVPs and oversaw the launch of probably 50 startups over the course of a year. Once I was on my own I got many offers to build apps or startups, more than I could count. It dawned on me that I was pretty much a VC or founder-for-hire at a minimum. Because I was attracting a lot of founders and new app ideas, this started to put the development company in an interesting position where I was getting 30-50 app ideas (serious bids to build them) a quarter. We could no longer take on every proposal we wrote or every idea pitched and thus the demand was high (ideas) but supply lower (developers). We had to start selecting which ideas seemed like they had the most chance at success or funding, which basically turned the whole process into something like a VC. 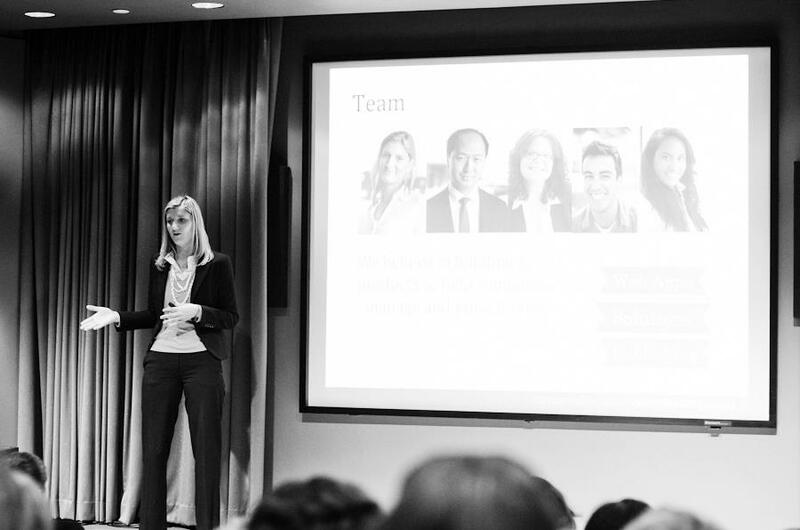 Presenting at Springboard Enterprises, New York City 2012. H: So it sounds like at this point you started transitioning to Venture Capital, how did you end up starting a fund of funds? E: Yes, well originally I wanted to become a partner at a VC firm. So I went back to some of the funds I knew and every single one of them was like yeah okay so bring me investors, bring me money, and then we’ll put you in charge of marketing. One VC firm even went into how I should freeze my eggs on interview #2! Shopping around for the right VC firm was brutal, but I still helped several firms along to pay-it-forward to learn more about the space as a whole because knowledge is power. I would make reports for well known funds, help with VC fundraising pitchdecks, scout startup dealflow and learn different mechanical pieces of VC. I knew I had skills which were valuable for companies– sometimes more so than capital itself– so I was eager to learn how to convert this knowledge into a path of becoming a partner, but if raising money as a female founder was tough, try becoming a partner at a VC firm! Then I had some luck. While helping about three Silicon Valley based VC funds with various things, fundraising or diligence or marketing, I stumbled across european pension funds. I was traveling in Germany for a diplomatic conference and before I knew it briefly met some people who were asking me if I knew anything about tech or venture capital. Do I know?! Of course I did. Upon their request I started sending them any of the materials I had and was more than happy to explain how the VC ecosystem worked. Then something crazy happened: they said yes. They said they wanted to invest. I called the VC fund I wanted to work at the most to start the process and quickly stumbled across a problem—the ultimate problem— these “people” of the European pension funds had a minimum commitments of anywhere from $50MM to $200MM which simply doesn’t work if you have a VC fund whose total fund size is say $150MM. I was incredibly frustrated, how did I find TOO MUCH MONEY? This ended up being one of the biggest professional blessings of my life. A puzzle to solve. From August 2016 through December 2016 I started doing research and spent an obsessive amount of time researching this whole fund-of-fund paradox. What is it? Does it exist? How many other pensions and banks are out there frustrated? Should there be easier and better access to venture capital for pension funds? True to my personality I honed in an unnatural amount of time to see if there was something happening on a global scale and there was. I reached out to several mentors and started crafting draft ideas of what a FOF (Fund of Funds) strategy would need to look like to be successful, and ran simulations to figure out if something like this could or should be built. On New Years Eve (2016 entering 2017) one of my mentors, Howard Morgan, gave me feedback that he thought this particular FOF strategy could work! Caroline McCarthy (who is on my board of directors now) was in my apartment for NYE and we started jumping around and screaming with joy. Let’s do it! 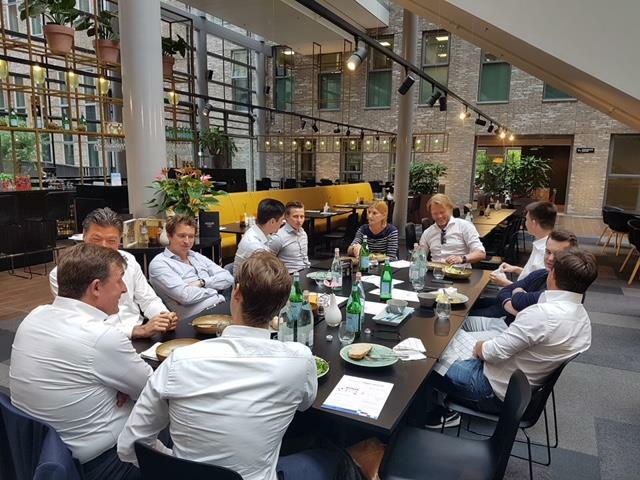 By March of 2017 I was in meetings with several Dutch government associations who also thought my FOF idea was a good one and it turned out my expertise in venture capital (plus software and company building) was useful for Europe. I also had experience working in Europe, so before I knew it, like within weeks, I was living in Netherlands with an office space in The Hague, to what would be the early building blocks of CCMFI or rather Cachette Capital’s first fund. I still live in Netherlands to this day and as it turns out there isn’t just a couple Dutch or European pension funds who need help getting into venture capital, there’s hundreds, almost thousands of European pensions who are shifting into venture capital. It’s pretty exciting times. Atomico recently released a report validating this point which is a great read. H: Can you talk more about your fund strategy? How do you source your deals (VC funds)? E: To be honest it was actually not as hard as I thought, because (shocker) VC funds want money! Once word had spread that I was on the LP/FOF side, everybody was pretty excited to work with me. By the time I moved to Netherlands in 2017 I had already been given at least 50 VC pitch decks, the floodgates were open. My fund has now gone through over 300+ VC funds so I think it’s safe to say we have dealflow. However, this flood of inbound potential investments started to teach me the nuances of venture capital and things I had never thought of before: some VC funds I really liked weren’t fundraising and others I didn’t care for had room in their funds. Timing, fund size, focus, region and other variables started to come into play. What was our (Cachette Capital) specific strategy? Did our fund have a focus? What were banks and pensions most comfortable with, what did they want? What’s the best mathematical position we could take as investors into venture capital funds? What’s the actual process of becoming an LP into a VC fund (remember I had been on the VC side but I had never LP-d into a VC fund). Turns out all this is solved by math and copious amounts of legal paperwork. In the end our fund decided on a couple core things: the fund would be $1B in size because anything smaller would not be diversified enough for pensions to acquire the risk , we’d focus on early stage venture capital because of its quick movement and traction with smaller check sizes into startups, and we’d be fully global, investing across Europe and the U.S. Ironically and to this day less than 2% of our fund has any current or future commitments to San Francisco based funds. For the most part the hardest piece of building this fund has been compliance and paperwork. In our case because of our fund’s size and who our LPs are, we had to spend six months simply building out the LPA aka the “Limited Partnership Agreement” which is like your fund’s rule book, it’s a big contract for your investors. Then you have investing into the venture capital funds, they also have their own LPAs and often there’s issues or edits that need to happen on that side to make the funds able to work together. Managing a FOF sometimes feels more like a lawyer than mathematician because you can’t pick one thing to be good at you have to be good at everything. The other thing (in our case) was timezones and languages: our fund is spread across several timezones from San Francisco to Zurich and we did this legal work in three languages: Dutch, German, English. We also have to be careful what we say, do and invest in because we have “the people’s money” which I take seriously, plus there’s other regulators at play so its certainly hard to sleep when there’s always gears to change and the pressure to perform is astronomical. Much of my story really has to do with consistently taking opportunities and having the grit to live through it. There’s a lot of luck and hunches mixed with politically navigating relationships in venture capital. On a daily basis I’m handed huge problems which turn out to be small, and small problems which can quickly become huge. On one hand it seems like it all happened overnight, yet in February of 2019 we will celebrate our two year anniversary. Which means that in twenty-four months we found a product market fit, setup offices in Europe, designed a fund from scratch, designed a firm from scratch and became trusted enough to scale venture capital across not just Europe but all of the world. We’ve deployed (invested) several million dollars to date with a big year lined up for 2019. And I even learned Dutch. Not bad for a girl who couldn’t make partner at a VC fund, huh? Helena Ronis is Co-founder and CEO of VoxSnap, a voice marketing platform for businesses. Helena was born in Ukraine, raised in Israel, and served in the Tech Unit of the Israeli Air Force. Before starting VoxSnap Helena worked in product management and marketing at Silicon Valley companies. Helena also started the largest and most active group for female founders of startups called Female Founders Community on FB.